Find artworks, auction results, sale prices and pictures of Ioannis, Jean Altamura at auctions worldwide. 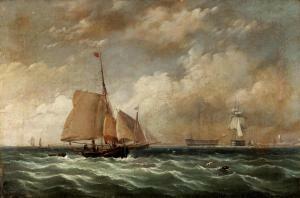 Sailing in choppy seas signed and dated 'Jean Altamuras 1875' (lower left) oil on canvas 45 x 66 cm. Literature Jean Altamouras, His Life and Works, exhibition catalogue, Benaki Museum, Athens 2011, p. 114. 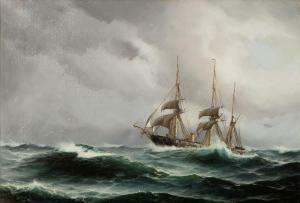 Painted in 18751, one year before Altamoura returned to Greece from Copenhagen where he pursued graduate studies at the Academy of Fine Arts on a state scholarship, Sailing in choppy seas is a splendid portrayal of a sailing ship, lovingly delineating every detail of masts, sails and rigging, including the minuscule figures aboard the vessel. The breadth and openness of the shimmering sky crossed by silvery travelling clouds and the choppy sea full of cool green waves animated by white splashes combine academic principles with a vivid sense of on-the-spot immediacy, while the shifting atmosphere and the mobility of light have been recorded with an effortless brilliance that recalls the finest work by R.P. Bonington.2 With free and vigorous brushstrokes, which add vitality and luminescence to the painted surface, this pioneering Greek seascapist, who emerged a decade before C. Volanakis but whose promising career was cut short at the age of 26, managed to elude the painstaking style taught and preached at the academies, capturing the fleeting beauty of natural phenomena (note the reflections of light flickering on the waves) and transforming nature's elements into a lyrical image. As noted by E. Kypreou, who curated the artist's major retrospective at the Benaki Museum in 2011, "Altamoura produced only a few works and none of them is mediocre. "3 1. As noted by G. Piemontese, who prepared the artist's monograph, Altamoura spent the summer of 1875 aboard the frigate "Jylland", an important vessel of the Danish royal fleet, recording his journey at sea and preparing sketches of different types of ships. See G. Piemontese, Giovanni-Ioannis-Jean Altamura, Foggia 2009, pp. 22, 24. 2. See M. Vlachos, Greek Seascape Painting [in Greek], Olkos editions, Athens 1993, p. 138 and M. Vlachos, "Bonington-Altamouras: Lives Related and Parallel" [in Greek], Kathimerini daily, 21.6.1992. 3. E. Kipreou, "Jean Altamouras, a Tempestuous Life" [in Greek], Kathimerini newspaper, 28.6.2009, p. 15.
, exhibition catalogue, Benaki Museum, Athens 2011, p. 145 (illustrated). Sailing ship in the port of Copenhagen is one of the extremely scarce works by Altamoura, a short-lived but exceptional seascape painter who by the age of 24 was already an acclaimed and highly paid artist enjoying the full support of the Greek Royal Court. As noted by E. Kypreou, who included this outstanding painting in the artist's major retrospective at the Benaki museum in 2011, "Altamoura produced only a few works and none of them is mediocre. At a time when an attorney in law was being paid fifteen drachmas for a court appearance, a canvas by Altamoura was purchased by the then Ministry of Marine Affairs for 2,000 drachmas." In 1873, Altamoura won a scholarship from King George I that enabled him to pursue graduate studies at the Academy of Fine Arts in Copenhagen. As noted by Kypreou, "in Copenhagen his mind opened up. Starting out with his experience of the Greek light and the Greek landscape, he blended them with the metaphysical light of the European north. He lowered the horizon like an old Flemish master and rested the sky on the ground." The shifting atmosphere, the mobility of light, the jewel-like details, such as the three figures aboard the vessel, and especially the breadth and openness of the shimmering sky that shines through luminous travelling clouds recalling his famous Port of Copenhagen at the Athens National Gallery, have been portrayed with loving care and effortless brilliance, combining academic principles with a vivid sense of on-the-spot immediacy to transform natural elements into a lyrical image. , exhibition catalogue, Benaki Museum, Athens 2011, p. 182 (illustrated). 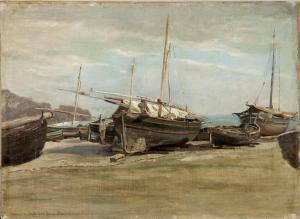 During his years in Denmark, Altamoura constantly returned to the seashore as a source of inspiration (compare Waiting for the tide, Bonhams Greek Sale, 20.5.2008, lot 6). Here, the suggestion of the atmosphere, the openness of the sky, mottled with travelling clouds, and the jewel-like details, such as the three figures in the middleground perfectly integrated in the coastal environment, have been portrayed with effortless brilliance, combining academic principles with a vivid sense of on-the-spot immediacy. arriving at some highly advanced pictorial formulations. As noted by E. Kipreou who included this outstanding painting in the artist's retrospective at the Benaki Museum in 2011, "Altamoura produced only a few works and none of them is mediocre. So, if you ever come across a low quality painting, then you certainly know it's not by him." , exhibition catalogue, Washington 2002, p. 68. See also Vlachos, Greek Seascape Painting [in Greek], Olkos publ., Athens 1993, p. 138. [in Greek], Kathimerini newspaper, 28.6.2009, p. 15. View of Øresund with Kronborg Castle, in the foreground men rowing. Unsigned. Oil on canvas. 28 x 39 cm. The Greek painter Ioannis (Jean) Altamuras is often described as the "Greek Skagen painter". King George I (The Danish prince Wilhelm) discovered Altamuras' talent for painting and helped him to join the Academy of Fine Arts in Copenhagen. Altamuras was only 20 years old when he arrived and spent three years in Denmark. He met Michael Ancher, who also found out, that he was a gifted painter and they became friends. Through him Altamuras befriended Anna Ancher, Holger Drachmann and P. S. Krøyer. He was inspired by the Skagen painters, and he even went to sea with the frigate "Jylland" to get the right knowledge of the maritime world. 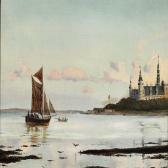 Altamuras painted Øresund and Kronborg many times during his stay in Denmark. See "Jean Altamuras. His life and works" , 2011 pp. 103, 124, 197-201. View of Øresund with Kronborg Castle, in the foreground men rowing. The Greek painter Ioannis (Jean) Altamuras is often described as the "Greek Skagen painter". King George I (The Danish prince Wilhelm) discovered Altamuras' talent for painting and helped him to join the Academy of Fine Arts in Copenhagen. Altamuras was only 20 years old when he arrived and spent three years in Denmark. He met Michael Ancher, who also found out, that he was a gifted painter and they became friends. Through him Altamuras befriended Anna Ancher, Holger Drachmann and P.
He was inspired by the Skagen painters, and he even went to sea with the frigate "Jylland" to get the right knowledge of the maritime world. Altamuras painted Øresund and Kronborg many times during his stay in Denmark. His life and works" , 2011 pp.